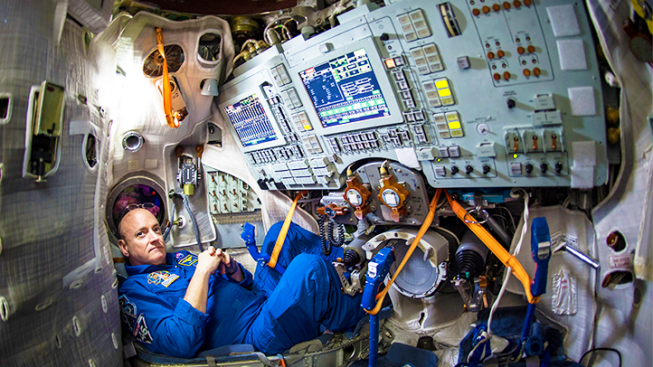 NASA Astronaut Scott Kelly is seen inside a Soyuz simulator at the Gagarin Cosmonaut Training Center March 5, 2015 in Star City, Russia, preparing for launch to the International Space Station in the Soyuz TMA-16M spacecraft from the Baikonur Cosmodrome in Kazakhstan on March 28, 2015. NASA astronaut Scott Kelly gave a shoutout to Chicago Bears fans from space Sunday. Commander Kelly, who is spending a year in space onboard the international space station, snapped a shot of Soldier Field from far up above as the Bears took on the Vikings, tweeting "#SundayNFLStadiumPicFromSpace #SoldierField taken during #NFLGameDay game! Who's in this picture? #YearInSpace"
On Oct. 16 Kelly broke the U.S. record Friday for the most time spent in space when he hit 383 days. He is more than halfway through a yearlong mission at the International Space Station and will eventually set a record for the longest single U.S. space mission. Kelly tweeted back to Earth that he hopes that his eventual 500-plus days in orbit will be exceeded by someone visiting Mars. He tweeted that his day began with a strikingly beautiful view of the Himalayas and vowed to visit them. Kelly and his ex-astronaut twin, Mark, on the ground, are part of an experiment on the long-term effects of space.